StatsToDo offers a suite of programs and explanations related to the statistics predictive tests. As all of them contains a great deal of details, many aspects discussed elsewhere will not be repeated here. This page discusses only Receiver Operator Characteristics (ROC), and supports the program in the Receiver Operator Characteristics (ROC) Program Page . Users are referred to the Prediction Statistics Explanation Page and the Meta-analysis for Predictions Explanation Page for other aspects of prediction, and the Sample Size for Receiver Operator Characteristics (ROC) Explained and Tables Page for sample size required in using the ROC. Historical Aspects : During the Second World War, the British invented the RADAR which reflects a radio wave against an object, and so were able to detect the German bombers coming over the channel. The early versions of RADAR was imprecise, and the signal contains much electronic noise and difficult to interpret. If the alarm was raised with a weak signal, there was a risk of false signal, wasting much fuel and energy in response. If the alarm was not raised until a clear signal is obtained, the risk was that the fighters were scrambled too late and more bombs would be dropped on the cities. In order to analyse the signal and make decisions on how to respond, the scientist developed a statistical method of handling the signals, and named this the RADAR Receiver Operator Characteristics. The method became widely used in signal analysis in many aspects of science and industry, and adopted in the analysis of tests and diagnosis in Medicine, under the term Receiver Operator Characteristics (ROC), with the RADAR part removed. 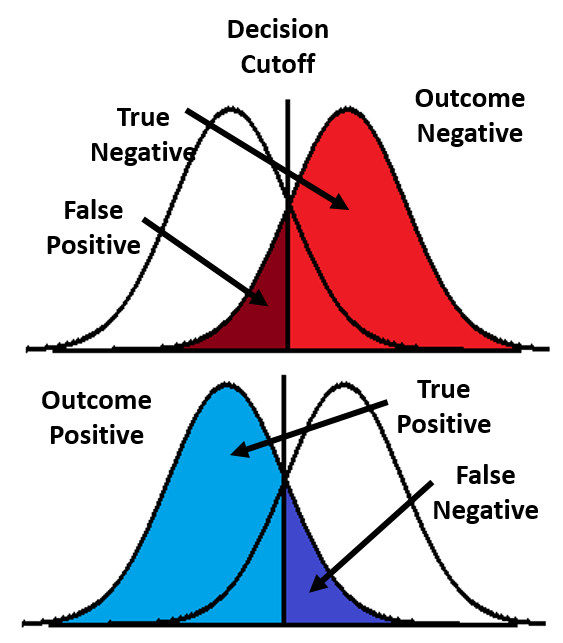 Theoretical Considerations : A scalar, preferably normally distributed measurement is used as a Test to predict a binary Outcome. We will use the use of maternal height (Test) to predict the need for Caesarean Section to deliver the baby (Outcome). The relationship between Test and Outcome is best demonstrated as the diagram to the right. In a sample that was delivered without Caesarean Section (Outcome Negative O-, red), the normal distribution curve defines the height we will use to make a binary decision whether it is Test Positive or Negative. In a sample that was delivered by Caesarean Section (Outcome Positive O+, blue), the normal distribution curve defines the height we will use to make a binary decision whether it is Test Positive or Negative. If the value used to make the decision changes, in our example, if the maternal height we used to predict changes, then TP,FP,FN, and TN also changed, and the TPR and FPR changed accordingly. The null value for θ is therefore 0.5, a useful test has a 95% confidence interval of θ that is greater than 0.5. 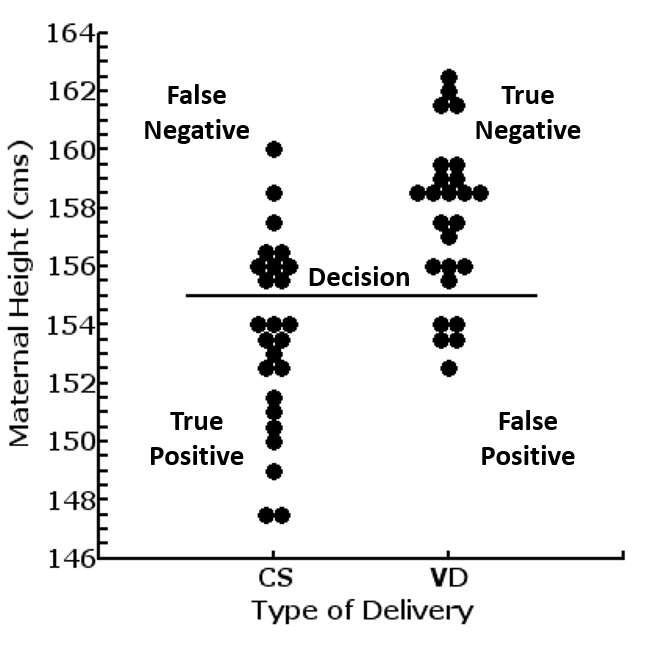 Where θ<0.5, the test predicts the opposite of the intended outcome. We wish to use the maternal height as the Test to predict the need for Caesarean Section as the Outcome. We reviewed our medical records and samples 25 cases that were delivered vaginally and 25 cases delivered by Caesarean Section, and recorded the maternal height. The data is as shown in the table to the right. Column 2 shows the test values, maternal height in cms. As a reduced height (lower value) is used to predict Caesarean Section (O+), the first row of column 2 is L for low values to be Test Positive. The plot to the left shows the distribution of the data points. Those requiring Caesarean Section (O+) are on the left and those delivered vaginally (O-) on the right. If the decision line is moved upward towards higher values, the number of positives, both true and false would increase and the number of negatives, both true and false, would decrease. If the decision line is moved downwards towards lower values, the reverse follows. The TP, FP, FN, TN, and their calculated derivatives of TPR and FPR, therefore changes as the decision line moves throughout the whole range of the test values. 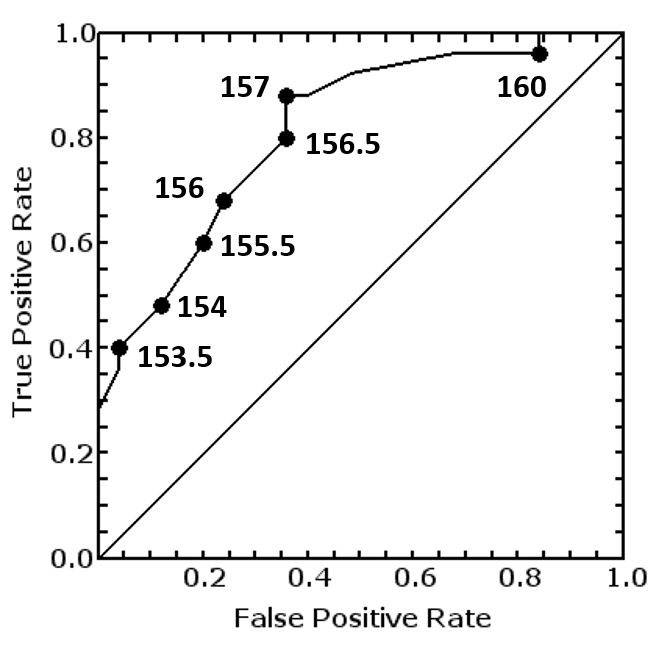 The relationships between TPR and FPR over the range of the values form the Receiver Operator Characteristic Curve, as shown in the diagram to the left. Looking at the diagram to the left, We can see that, if we were to set the cut off value for decision at 160cms, 24 out of 25 cases that had Caesarean Section would be True Positive, but 21 out of 25 cases delivered vaginally would become False Positive, making True Positive Rate TPR = 24/25 = 0.96 and False Positive Rate FPR = 21/25 = 0.84. Using the first 2 columns of the default example data from the Receiver Operator Characteristics (ROC) Program Page , using maternal height to predict the need for Caesarean Section, the results are interpreted as follows. The ROC value θ = 0.81, Standard Error = 0.06, 95% Confidence interval = 0.70 to 0.93. As the 95% confidence interval does not overlap the null value of 0.5, maternal height can be concluded as a significant predictor of the need for Caesarean Section. Approximately therefore, the most accurately cut off value to predict the need for Caesarean Section is a maternal height of 156cms to 157cms. At 153cms, the TPR is 0.36, against a TNR (1-FPR) of 0.96, so that TNR is roughly x3 that of TPR. This can be taken as a cut off level for action, for example, to proceed to an elective Caesarean Section. The table to the right also provides the Likelihood Ratios that can be used to calculate Bayesian post-test probabilities from pre-test probabilities under differing clinical situations. The procedures for doing so are discussed in the Prediction Statistics Explanation Page . Unpaired comparisons of ROCs are used to compare the predictive quality of a test under different conditiopns on in different populations. An example is comparing the ROC using maternal height to predict Caesarean Section in nullipara and multipara, or between women from urban and rural communities. 95% Confidence Interval of the Difference = Diff ±zSEDiff, where z=1.65 for the one tail model, and 1.96 for the two tail model. Paired ROC comparisons allow the comparisons between different tests for the same outcome, by administering all the tests in the same individuals. Such a comparison is powerful in that intra-subject comparisons are made, reducing the influence of between subject variations. The procedure used is as described by Delong et.al., (see references). This algorithm is particularly attractive, in that it is nonparametric, so allowing for the comparison between measurements of different distributions, providing that they are at least ordinal. The data used for demonstration in this panel is the default data from the Receiver Operator Characteristics (ROC) Program Page . In this exercise, we wish to compare 3 Tests to predict the need for Caesarean Section, these being maternal height (cms), maternal age (years), and maternal BMI. We have collected data from 25 mothers who delivered by Caesarean Section, and 25 delivered vaginally, the data are as in the table to the right. 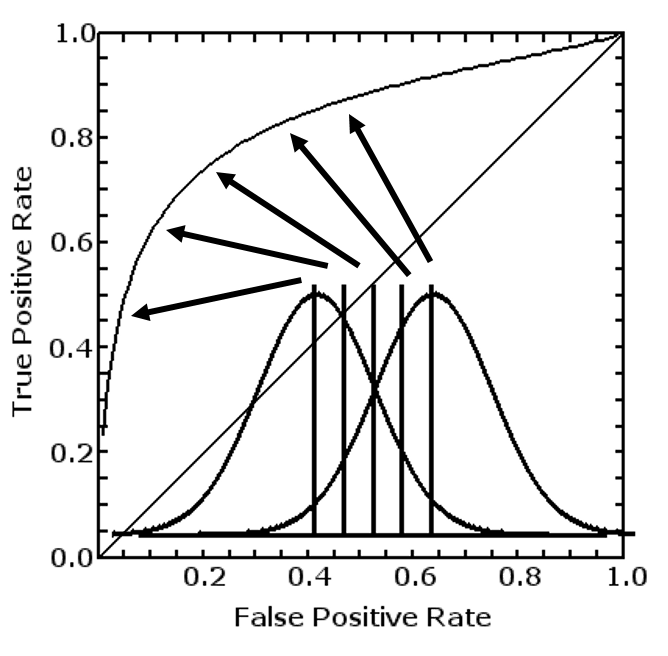 The table to the left shows correlation between the 3 tests, and these must be used to correct the differences between the 3 θs. After correction, the test for heterogeneity between the 3 θs is chi square=10.39, df=2,p=0.006. This is statistically highly significant, allowing an interpretation that the 3 θs are different to each other. The 3 ROC curves are plotted as shown in the diagram to the right, maternal height in red, age in green, and BMI in green. The θ values are shown in the table to the left. The 3 ROCs can also be repeatedly compared pairwise, and the results shown in the table below and to the left. 95%CI = 95% confidence interval of the difference, Diff±2.41SEDiff. From these results, it can be seen that maternal height is the best predictor, significantly better than maternal age. 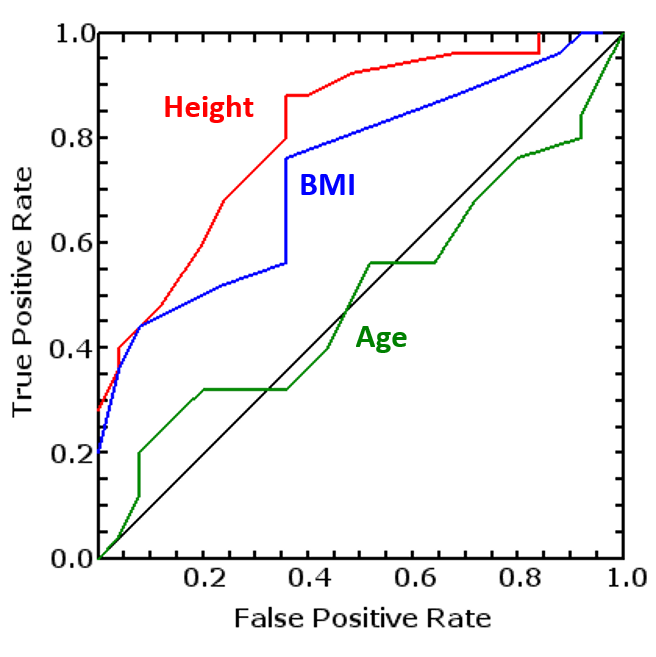 Maternal BMI is second best, but it's θ is not significantly different to maternal height or age.